Over the last five years I’ve purged a lot of material things from our home. Getting rid of these items took courage and decision making which are hard when losses pile up. If I cry in front of you about the way some of these losses impact my heart still, you might not understand. 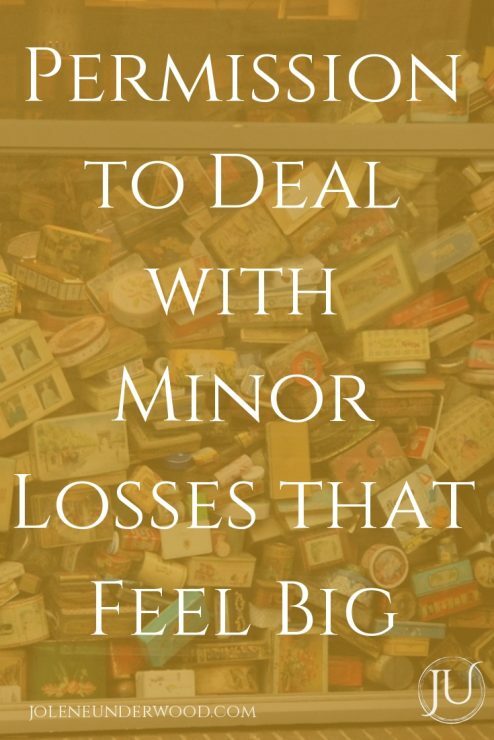 Learning to deal with minor losses that others can’t relate to requires intentionality and courage. If you’re dealing with this too, I am praying for you. In 2012 we moved into a home over twice the size of what we were used to. We also had more than double the people, which meant adding beds, bedding, bathroom supplies, clothes, toys, eating supplies, furniture and more. Fifteen people, three full bathrooms, and two living rooms y’all. When we came back from “the ranch” in 2013, we had a ton of stuff to get rid of. My heart, mind, body, soul and home were full up with overwhelm. I spent most of my days depressed and not functioning beyond the bed or couch where I watched endless Netflix and tried reading books with severe attention challenges. Every once in awhile I’d get enough gumption to start clearing out one area at a time. Heart, mind, body, soul, and home. Little by little it made an impact. What weighs on our hearts as overwhelming and hard to do is best tackled bit by bit, step by step. In addition to the junk accumulated, because I didn’t intentionally choose what needed to stay and what could go, I gave away hundreds of books from the non-profit library we once ran. The added clutter around me added to the anxiety within me. Even if it was clean stuff and organized clutter, it added to feeling trapped which I struggle with. I needed to clear out physically because it impeded my ability to heal emotionally. There are a few things I wish I had kept, but they are replaceable. I’m still thinking about that new hardcover book I had, Night of the Moonjellies, and a handful of other titles. What can’t be replaced are the things I never wanted to purge. It wasn’t my choice to get rid of them. Like the ornaments from my childhood that got left in bins at the ranch. After pleading with Daddy D to find these bins, and several return trips, we finally got them back. One included an open ziplock bag with my daughter’s name on it. Just the name. Her name was right there. Her ornaments were not. As was the case for much of our home while we lived at the ranch, if it was there, it was considered community property. These ornaments were some of the most precious items I had and I didn’t realize this until it was too late. If I’d known the heart-tie I had when we moved to the ranch, I wouldn’t have brought them with us. Each item was an individually chosen gift with the child’s personality in mind. They’d been given as part of a special family tradition that occurred every Christmas Eve for all the decades I knew. My mom started it and I carried it on to the next generations. I still grieve the loss. An emotional connection tied to physical possessions always makes it hard to let go, whether we choose to do so or someone chooses for us. Just knowing our special items were ransacked grieved me as if I’d been attacked personally. It may seem inconsequential, but the pangs of loss still surface. I grieved the loss of the children when they left our home and that was big. I also grieved the transition of moving there to learn a new way of life, moving back home to an altogether different way, and losing the dream we held in the middle. Sometimes material or circumstantial losses are harder to deal with than we expect. People have a hard time understanding because loss through death or a major financial blow are typically understood as bigger losses. It’s easy to see how they could impact one’s life significantly. What’s harder to see is the way our hearts individually experience life, or how our stories throughout life filter the way we’re impacted by life experiences. Our tendency is to compare ourselves with another and that doesn’t leave room for the mystery of what’s going on inside the heart of another person. We can compare anything and everything. Loss and grief are no exception. By making this kind of comparison we are prone to dismiss the reality of feelings that need to be felt in order to heal. The dismissal can be personal against ourselves or interpersonal against others we are in relationship with. What pain surfaces when you no longer had something you once loved? 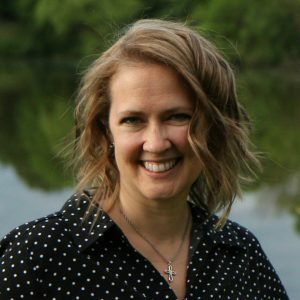 Have life transitions built up? Does it feel as if all the hills of change created a collective mountain? 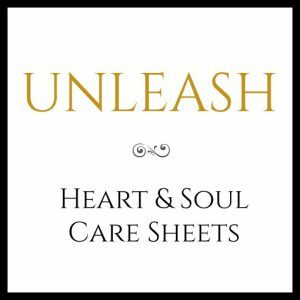 What prompts shakiness in your heart and tears to surface? Are there losses that aren’t as easy to identify? For example, the loss of what you thought was true about someone that really wasn’t. How are feelings being dealt with or ignored? Are feelings quickly shoved aside because you believe you shouldn’t feel them? What may seem like a big deal to me, or to you, may not be a big deal to someone else. That’s OK. Your feelings are valid. They are your feelings tied to your experiences and your belief filters. 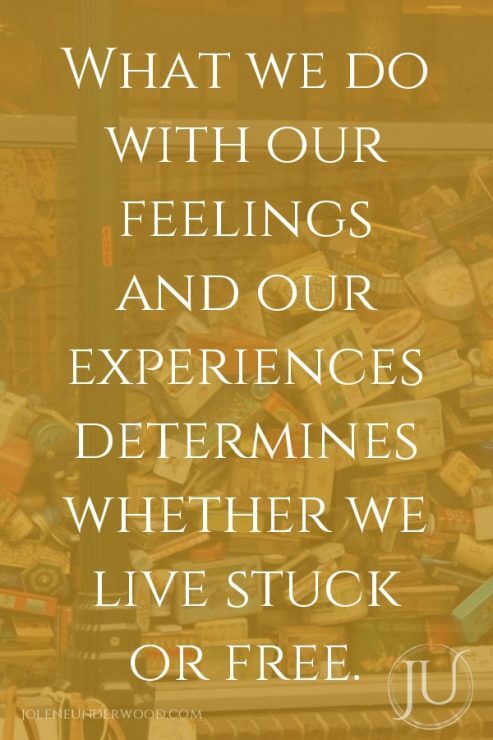 What we do with our feelings and our experiences determines whether we live stuck or free. We each to have make our own choices about living well. 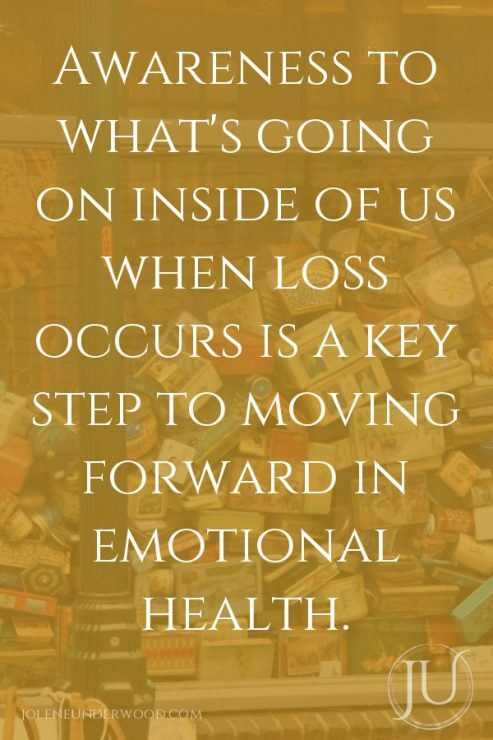 Awareness to what’s going on inside of us when loss occurs is a key step to moving forward in emotional health. 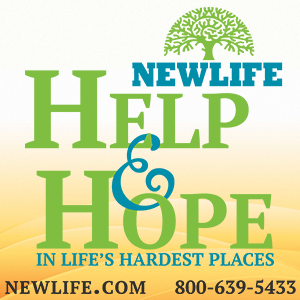 No matter what kind of loss we experience, we need to grieve. 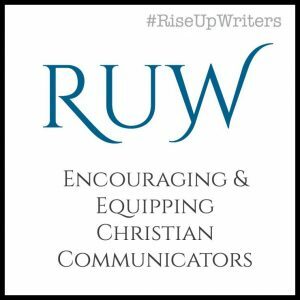 Feeling the anger and sadness opens you up to the fullness of God’s redemption. When a wound continues to press in on your heart, it’s not helpful to pretend it’s not there. 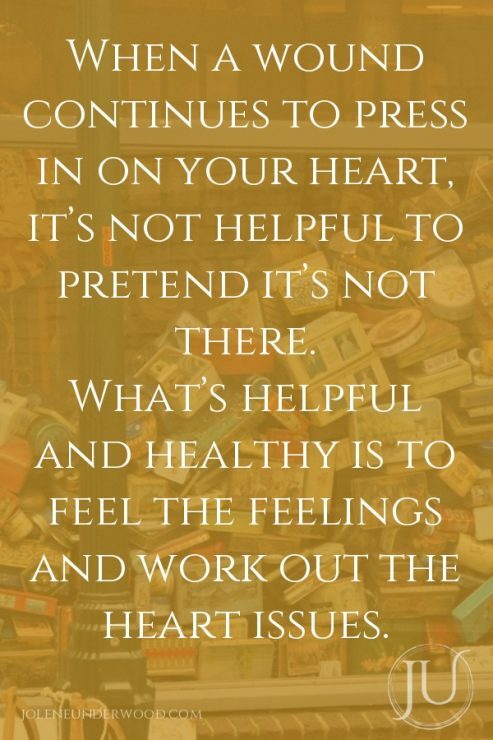 What’s helpful and healthy is to feel the feelings and work out the heart issues. 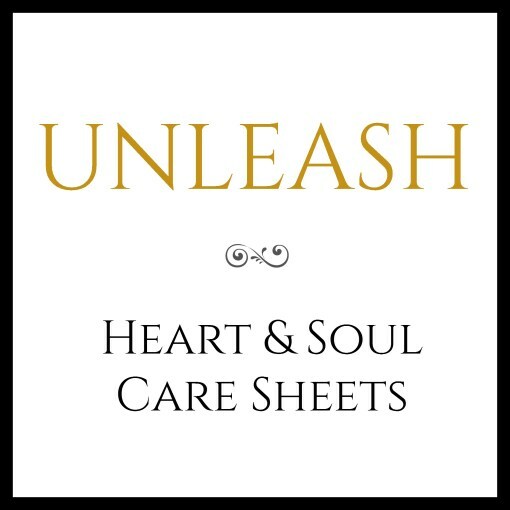 A great way to identify feelings and process the hurt is through Unleash: Heart & Soul Care Sheets. The temptation to push aside feelings we think “shouldn’t” be there can keep you stuck and the pain stays. What you felt originally morphs into a dulled ache that accumulates and eventually it will effect you and others around you, even if you don’t notice it. 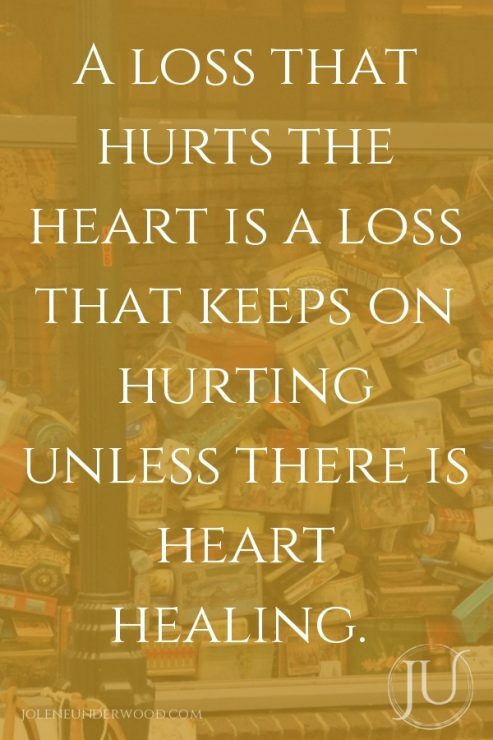 A loss that hurts the heart is a loss that keeps on hurting unless there is heart healing. It doesn’t matter if it’s lost ornaments, a job change, a child walking away from the faith, a financial loss, the onset of illness, the death of a loved one, or something else. Hurt doesn’t just disappear, though it may dissipate as healing occurs. Loss is by nature the experience of no longer having something you once had. To presume we won’t feel emptiness is to deny ourselves the reality of something that held value in our lives. 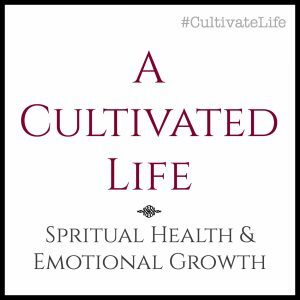 Emotional healing occurs when we realize the longings of our heart for what they are, or what they have been, and we actively deal with them. When we accept the truth of no longer having something we wanted. Even the death of a dream can cause great feelings of loss. 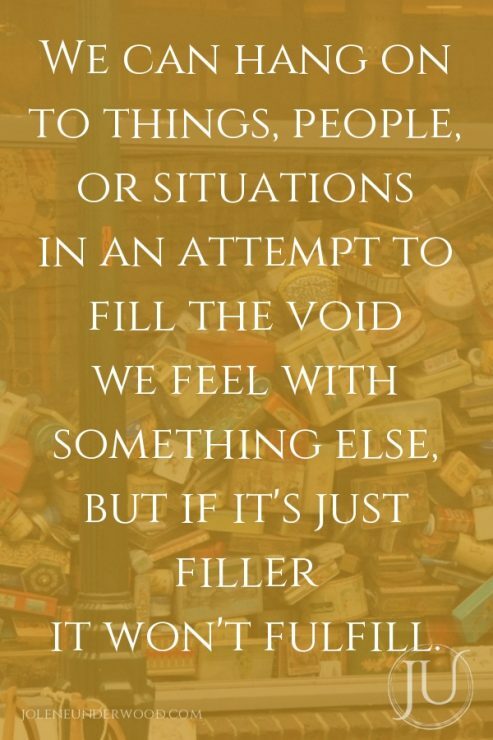 We can hang on to things, people, or situations in an attempt to fill the void we feel with something else, but if it’s just filler it won’t fulfill. Ultimately, we need to purge our hearts and souls of the belief systems that trip us up. We need to clear out the clutter of idols and props that have taken place of what only God can do. Heart, mind, body, soul, and home. 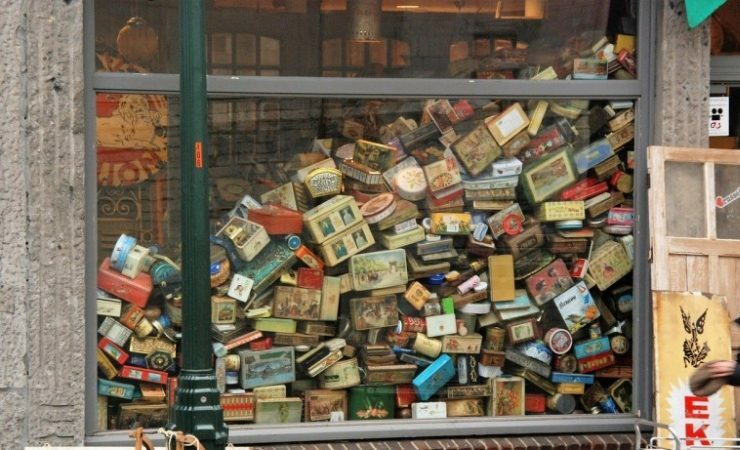 They can all become cluttered and impede our ability to live well. Choosing what to let go of and taking the steps required to do so means walking with God towards a life of freedom. As the feelings come up, don’t shove them away or tell yourself they don’t matter because they seem minor to you or others. Invite God into the hurt places and see what He might do as you lay every loss before Him. I’m still sad about the ornaments. I don’t know if I’ll ever not feel this way to some degree. That’s OK. I choose to keep moving forward in faith and healing and I hope you will too.